Though summer is winding down, soup season is just gearing up! If you´re craving rich and creamy flavors, but don´t want to splurge on calories, the two new creamy flavors of Progresso® Light soups are here with a reason to celebrate! At 100 calories per serving, now you can indulge in warm, creamy soups like Light Creamy Potato with Bacon and Cheese* and Light Chicken Pot Pie Style* without feeling guilty. Packed with indulgent, satisfying flavor, these two new Light creamy soups are the perfect way to make thoughtful eating decisions without sacrificing incredible taste. Is your mouth watering yet? Want to give these new Light creamy soups a try? 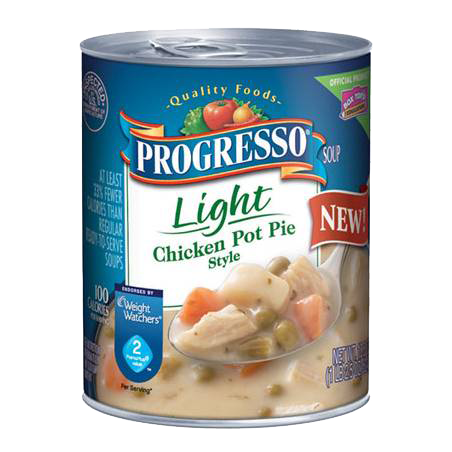 Then grab your soup soon and download a printable coupon for $1.25 off the purchase of 4 cans of Progresso® soup today! 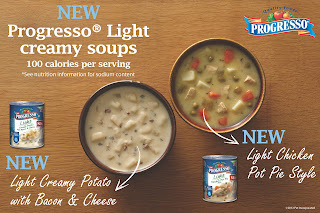 Be sure to share this coupon with your family, friends and readers so they too can take advantage of the savings and try Progresso Light creamy soups! disclosure~ this info was provided to me thru MyBlogSpark.